Charles (Chuck) Mader was a dues paying member of the Los Alamos Mountaineers from 1955 thru the 60's while it was part of the Colorado Mountain Club. 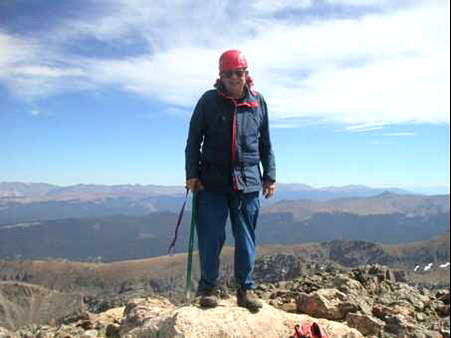 He has continued his membership in the Colorado Mountain Club since then (Gore Range Group). Chuck gave slide shows of climbs several times and attended many of the clubs programs. The Los Alamos Outdoor Association and the Mountaineers overlapped in both membership and meetings during the 50's, as well as in mountain adventures. He also led several Club/Association climbs and hikes. Trips to the Colorado Fourteeners began in the 1950's, at the same time that the Mountaineers' club was being formed. Outdoor enthusiasts from Los Alamos began to drive up to Colorado to club the high peaks, either as private groups or as small club trips. Charles was a Los Alamos scientist who enjoyed climbing Fourteeners, starting with Blanca Peak in 1954 when he was a summer student at the Lab. Chuck climbed with many Club members, including Emily Wilbanks, George Bell, Gene Tate, Liz Gittings Marshall, Tom Stephenson, Ken Ewing, and Marvin Tinkle. Chuck recalls that "Most people who came to town were single. It was considered risqué for a single woman to join a group of men for a climbing trip. A youth group was formed at the Methodist Church and by 1960, 50 couples were married, none ever divorced!" 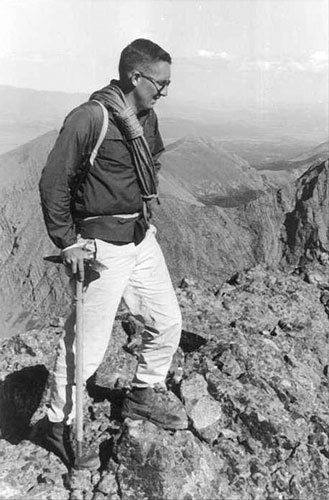 In 1959 Chuck Mader became the 65th mountain climber to have climbed the 54 Colorado peaks above 14,000 feet and has climbed 95 of the 100 highest Colorado mountains. He has climbed Monta Rosa and the Matterhorn among other Swiss mountains. What was it like to climb Fourteeners in the 1950's? Chuck Mader says that "The main hazard was the long drives, no speed limits in those days. We would pile into a big sedan for the drive up to Colorado. Then we could rent old WWII jeeps at most service stations. Everything was open -- there were no wilderness areas, and lots of mines were still running. Usually one could drive to timberline. We usually climbed using a motel as a base. In those days the packs were painful, no waist straps, so it was better to do most of the peaks as day hikes even if it meant long days." Maps were terrible in those days, and it could take several trips to find a way up a mountain. Many peaks were still being surveyed. The peaks often had lights with batteries on top, to help surveyors take readings at night. Many peaks still had the original registers. The list of Fourteeners was still in flux, and the "hundred highest" wasn't even a concept. Chuck climbed Mt. Stewart and Grizzly peak before they were demoted from the Fourteener list. He finished by climbing Snowmass in 1959, but later did Holy Cross and Ellingwood when they were added to the list. His climbing slides are available here and also in the Colorado Mountain Club library archives. Chuck recalls that the club's most experienced mountaineers had some disdain for doing Fourteeners. They called most of them "anthills," or "Maderhorns." Chuck did the Mt. Wilson - El Diente traverse on a trip with George Bell, who had lost two toes on K-2. George kept asking, " do you STILL want to be roped up"? Chuck Mader's friend Ed Williamson wrote a novel called "Durango Light," which featured a character Buck based on Chuck Mader. The novel is set in Durango and describes life, love, and other adventures in Durango, including climbs of Jupiter, Windom, Sunlight, and Mt. Eolus. The photo above of Chuck Mader was used on the cover of the book, which was taken in 1959 on top of the Crestone Needle. The group had just finished the rescue of a couple of climbers who had spent the night on a ledge on the Ellingwood Arete after having lost their rope. The photograph of Chuck (above) was taken by one of the rescued climbers. He and his wife have skied together for over 50 years at ski areas from New Zealand to Alaska including the Tasman glacier, Dubai, Zermatt, and have heliskied in Canada. They have skied together more than 4000 days. After retirement in 1986 they often skied more than 100 days a year. In 1998 they skied together 136 days by skiing in the Southern and Northern hemispheres. After he was 80 years old Mader skied over 1.6 million feet or 1700 miles in 2010-2015. Dr. Charles L. Mader is President of Mader Consulting Co, and a Retired Fellow of the Los Alamos National Laboratory. He is a Fellow of the American Institute of Chemists, recipient of the Los Alamos Distinguished Performance Award, and was the organizer and first Co-ordinator of the Los Alamos Fellows. He is listed in Who's Who in the World and was a member of the National Academies' Technical Assessment Board Panel on Armor and Armaments. He is listed in Wikipedia -- https://en.wikipedia.org/wiki/Charles_L._Mader.